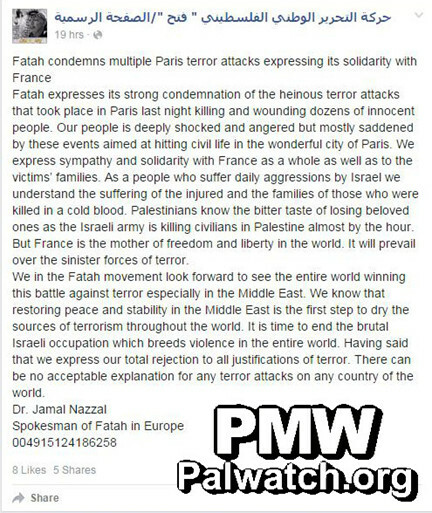 The Palestinian Authority and Fatah have condemned the terror attacks in Paris on Friday, Nov. 13, 2015. The PA and Fatah, both of which are headed by Abbas, have also exploited the horrific attacks that killed 129 and wounded hundreds to draw an imaginary false parallel to Israel’s alleged “terror” against Palestinians and to repeat the allegation that Israel is like the Islamic State terror organization. 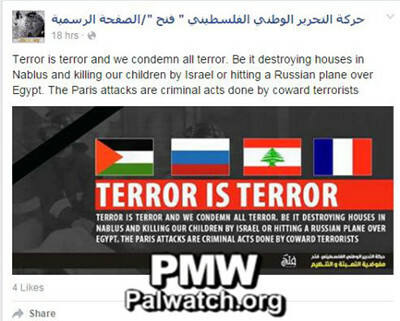 The Fatah movement posted the above image with the headline “Terror is terror.” Fatah implied that Israel is the equivalent of Islamic State by showing the Palestinian flag next to the flags of Russia, Lebanon and France. The flags refer to recent ISIS terror attacks that took place in and against these countries: the explosion on a Russian plane in Egypt that killed everyone on board, in total 224 (Oct. 31, 2015), a double suicide bombing in Beirut, Lebanon, that killed at least 41 and wounded over 200 (Nov. 12, 2015), and the attacks in Paris, France, which killed 129 and wounded over 300 in several simultaneous shooting and suicide bombing attacks (Nov. 13, 2015). Ironically, Fatah’s insurances that it “condemns terror” and its simultaneous allegations that Israel commits acts of terror come at a time when Israel is facing numerous Palestinian shooting and stabbing attacks in a wave of terror that has been ongoing since October 2015 and in which 11 Israelis have been killed. Palestinian Media Watch has documented that these attacks have never once been condemned by Abbas or any other PA or Fatah official. On the contrary, Abbas’ government and political party have both fueled the Palestinian rage and encouraged more violence. WAFA, the official PA news agency, reported that PA Chairman Abbas had “condemn[ed] what he described as 'terror attacks, affirming his full support for France in face of terrorism and stressing the need for the international community to take a stand and confront such terrorist attacks that lead to a spike in tension.’” [WAFA, Nov. 14, 2015] It then repeated the statement above by Fatah condemning the attacks and vilifying Israel. 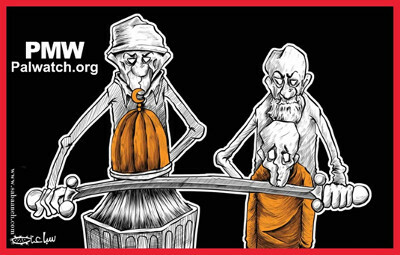 Click to view PMW’s documentation of other PA conspiracy libels about Israel. The spokesman for the PA National Security Forces, Adnan Damiri, posted statements on Facebook that hinted at Israeli responsibility for the attacks in Paris. Damiri speculated why terror strikes at Beirut and Paris, two capitals known for their standpoints of support for the Palestinians as opposed to Israel, and asked rhetorically who would gain from such acts. The implicit answer is “Israel,” and indeed people responding to his posts wrote this explicitly. They are a product of labs of the CIA, the Mossad [Israeli Secret Intelligence Service], Scotland Yard, and others whose desire is to achieve a goal in the world... They set this ‘savage virus’ loose in their labs, groups of mentally ill with no mercy in their heart... It is not coincidence that human blood was exploded in Paris at the same time that certain European sanctions are beginning to be implemented against settlement products, and while France leads Europe in advising the security council that will implement the two-state solution, Palestine and Israel - which the Israelis see as a warning of sudden danger coming from the direction of Europe, where the Zionist, occupying, settling endeavor was born. Moaz Al-Kasasbeh - Jordanian fighter pilot whose plane crashed in northern Syria during a military operation targeting Islamic State. Kasasbeh was captured by IS militants and brutally executed on Jan. 3, 2015. Islamic State released footage of the execution on Feb. 3, 2015, showing Kasasbeh being burned alive in a cage. Duma arson attack - On July 31, 2015, two Palestinian houses in the West Bank village of Duma were set afire by Molotov cocktails thrown through their windows. 18-month-old Ali Dawabsheh was killed in this attack, his father, Saad Dawabsheh, died of injuries 8 days later, and his mother, Reham Dawabsheh, died of injuries 5 weeks later. Israeli leaders and citizens from all sectors of society condemned this attack, and Israeli Prime Minister Benjamin Netanyahu told PA Chairman Mahmoud Abbas that all Israelis were disgusted by the crime, adding, “We will not countenance terrorism of any kind.” He ordered the security forces "to use all means at their disposal to apprehend the murderers and bring them to justice forthwith." There is suspicion that this was a nationalist attack carried out by Jewish extremists in revenge for Palestinian terror attacks. However, the crime remains unsolved with no named suspects. Murder of Palestinian teen Muhammad Abu Khdeir - On June 12, 2014, Israeli teens Eyal Yifrach, Gilad Shaar and Naftali Frenkel were kidnapped by Hamas terrorists while they were hitchhiking. The boys' bodies were found by Israeli security forces near Hebron on June 30, 2014. They appeared to have been shot to death soon after the abduction. Two days later, Palestinian teen Muhammad Abu Khdeir was kidnapped and murdered in Jerusalem in a revenge attack by Israeli extremists. Following this murder, Palestinians took to the streets of eastern Jerusalem in violent and continuous protests. Prime Minister Benjamin Netanyahu and other Israeli ministers immediately condemned the revenge killing in the strongest terms. Israeli police arrested six Israeli suspects on July 6th; under interrogation, three of the suspects confessed to murdering Khdeir. Fatah expresses its strong condemnation of the heinous terror attacks that took place in Paris last night killing and wounding dozens of innocent people. Our people is deeply shocked and angered but mostly saddened by these events aimed at hitting civil life in the wonderful city of Paris. We express sympathy and solidarity with France as a whole as well as to the victims’ families. As a people who suffer daily aggressions by Israel we understand the suffering of the injured and the families of those who were killed in a cold blood. Palestinians know the bitter taste of losing beloved ones as the Israeli army is killing civilians in Palestine almost by the hour. But France is the mother of freedom and liberty in the world. It will prevail over the sinister forces of terror. We in the Fatah movement look forward to see the entire world winning this battle against terror especially in the Middle East. We know that restoring peace and stability in the Middle East is the first step to dry the sources of terrorism throughout the world. It is time to end the brutal Israeli occupation which breeds violence in the entire world. Having said that we express our total rejection to all justifications of terror. There can be no acceptable explanation for any terror attacks on any country of the world. “RAMALLAH, November 14, 2015 (WAFA) - The Palestinian presidency offered its solidarity and sympathy with the French government, following the string of ‘terrorist attacks’ that hit Paris late Friday. According to media outlets, terror attacks targeted different locations in Paris, leaving at least 150 killed, and scores others injured. Following the attacks, the French government declared a state of emergency and closed its borders. The Palestinian presidency reported on President Mahmoud Abbas as condemning what he described as 'terror attacks, affirming his full support for France in face of terrorism and stressing the need for the international community to take a stand and confront such terrorist attacks that lead to a spike in tension. Abbas offered his condolences to his French counterpart, François Hollande, and to the families of the victims of the terror attacks, wishing the sick a speedy recovery. In order to apprehend 20-year-old Palestinian terrorist Azzam Shalaldeh, Israel carried out an undercover military operation in which soldiers disguised themselves as Palestinians in order to infiltrate the Al-Ahri hospital in Hebron where the terrorist was hiding. Shalaldeh had stabbed and injured an Israeli civilian near the settlement of Meitzad in Gush Etzion on Oct. 25, 2015, and was shot and injured by the Israeli civilian. Shalaldeh was successfully apprehended, and one family member who tried to intervene was shot and killed. “The explosion of the Russian plane 23 minutes after its takeoff from Sharm el-Sheikh airport in the end of October, was not an ISIS operation but a terror operation orchestrated by international and regional security services. The announcements made by American spokespersons are the best proof of that; The first statement made by American institutions said that they [the US] intercepted phone calls between ISIS and a country in the region. The following day, they withdrew the statement and released a different one, according to which the intercepted phone calls were between Takfir organizations (i.e., those defining other Muslims as unbelievers). The American statements were consistent with the Israeli and British statements. Eventually [they] demanded to intervene in the investigations directly, in order to ‘shuffle the deck’ and eliminate the findings made by the Russians and the Egyptians. If the rational estimations point to [the presence of] fingerprints of Western and Israeli security services, that leaves much room for questions, such as: Why was the operation carried out precisely against the Russian plane? What is the significance? What messages are the institutions behind the operation trying to convey? Are the messages intended for Egypt, Russia, or both? Does the operation signify a significant turning point in the secret conflict between the allies? And does this terror operation entail the drawing of new horizons in the Egyptian and Arab policy? In that case, what is the objective? A. To strike a blow to Egyptian tourism which constitutes 14.8 percent of the Gross National Income. B. To strike a blow to Russian tourism in Egypt, which constitutes 35 percent of its tourism in total. [Russia] takes first place (in terms of number of tourists to Egypt -Ed.). C. To question Egypt's military ability to keep Egyptian cities and tourist attractions safe. D. To leave a dark stain on the relations between Egypt and Russia. E. To intensify the economic woes of the new regime [in Egypt], depriving it of any chance of recovery. A. To warn Egypt of the consequences of its policy, which is uncoordinated with the US and Israel. B. 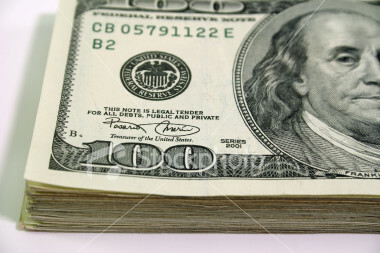 To threaten with a hard stick (terror) [parenthesis in source] in order to strike at the pillars of Egyptian economy. C. To direct Russia’s attention to the dangers posed by its spreading into the Arab states in the region, especially Egypt, Syria and Iraq. D. To remind them that the long arm across the Middle East still belongs to the US and Israel. E. To harm any kind of alliance between Egypt and Russia, or to put it through difficult and complex tests.